For greater returns, a manufacturer must assist distributors in selling products. Consider a strategy to covering all angles — sales tools for the reps, in-store point-of-purchase promotions, valued give-aways, and relevant advertising. A multiple pronged approach re-enforces your message and sells! 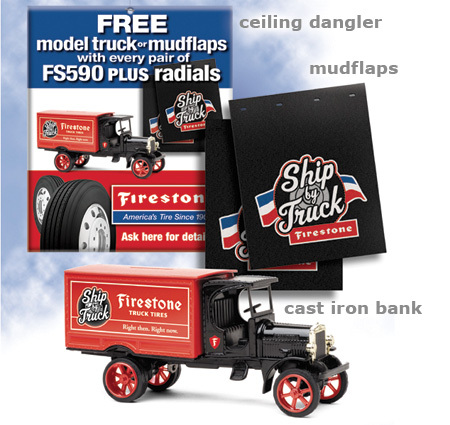 Firestone’s FS590 PLUS tire sale was planned to run through the summer. The Ncutt designed campaign was so successful that they sold out of tires in several weeks. Promotional gifts were offered through eye-catching point-of-purchase displays. Ncutt also developed an incentive program for the sales reps. The combination of the manufacturer’s special offer to the customer AND the incentives for the dealers and reps sold TONS of tires.